Can you dive to the top corner of the goal in an instant? If you’re not yet at that level, then strength and power training as discussed in this article will help you. While jump training is just one of many aspects that can improve your goalkeeping, it is still able to give you an advantage over your less-trained competition. Can you remember any times when you jumped for the ball and just barely missed it. I’m sure you can think of many examples. 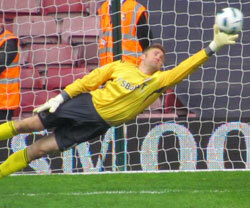 That is the sort of time when jump training really shines through, helping you to make difficult and impressive saves. Usually 180cm tall or more. Should have a high level of fitness, about 10% less than on-field players. Should have a higher vertical jump than on-field players. Height is the only uncontrollable factor above, so if you’re short and have finished growing then you’re out of luck. Weight can (and should) be increased by increasing muscle mass. Everything else can be improved through training. By looking at the above data you can see that sprint speed is not the difference between first team players and reserve players. More important is agility, endurance and vertical jump. That data is for the whole team, but the same trend probably applies in goalkeepers, especially for vertical jump. The difference between reserves and first team players is only about 1-5%. That sort of gain is easy to achieve with proper training if you’re not yet at the elite level. 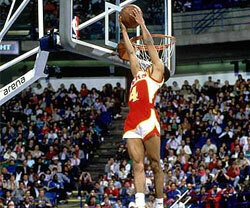 Consider this: to jump higher you have to explode off the ground at greater speed. If you are able to explode vertically, forward and laterally faster than another goalkeeper, you are at an advantage over him. If you can jump from the center of the goal to the corner 0.1 seconds quicker than him, that is 0.1 seconds less quickly that you have to react, you have more time to think before acting. You can’t really train your vertical jump alone. 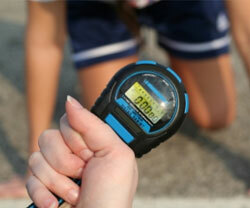 When you train your jumping, you are also training your running speed and agility. That is because they all benefit from the increased power required to jump higher. This is a benefit though, as the one training method will improve several areas of your game. Unlike basketball players who need mainly vertical jump, goalkeepers can benefit from improved vertical, forward and lateral jump. 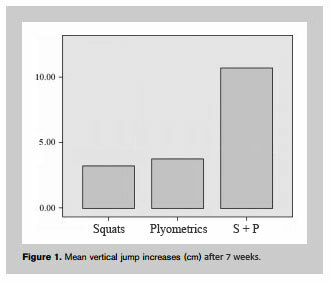 Your training will be roughly similar to regular vertical jump training (weightlifting + plyometrics) with the modification being that your plyometrics program will also include forward and lateral jump training. More specifically, you will alternate between the following two workouts for a total of 3 training sessions per week. It combines strength and power exercises working your full body, making you faster and more explosive. It should take you about 45 minutes per session with about 2 minutes break between sets. The main thing you need to be doing is gradually increasing the resistance level (weight lifted or height/distance jumped), and working at around 85% intensity. If you don’t already have good technique for squats, power cleans and deadlifts, I’d recommend reading Starting Strength to make sure your lifting technique is efficient and safe. No Responses to "Jump Training for Goalkeepers"